In Chianti, wine is an ancient tradition. From the Etruscans to the Romans through the Middle Ages, follow along in the fascinating history that brings “Bacchus to Tuscany,” as the great poet Francesco Redi once wrote. The origins of the name “Chianti” aren’t certain: according to some versions of history, the name could come from Latin for clangor (noise), from the sound of the hunt that rang throughout the forests that once covered the entire territory. Other versions say that it comes from the Etruscan word Clante, the name of a widespread Etruscan family in the territory, or—similarly—clante (water), as the area has always been rich in water sources. Already from these possible origins, one can intuit the richness and fertility of the land of Chianti, with its mild climate and verdant flora and fauna, creating a territory well-adapted to inhabitation since the second millennium BC. 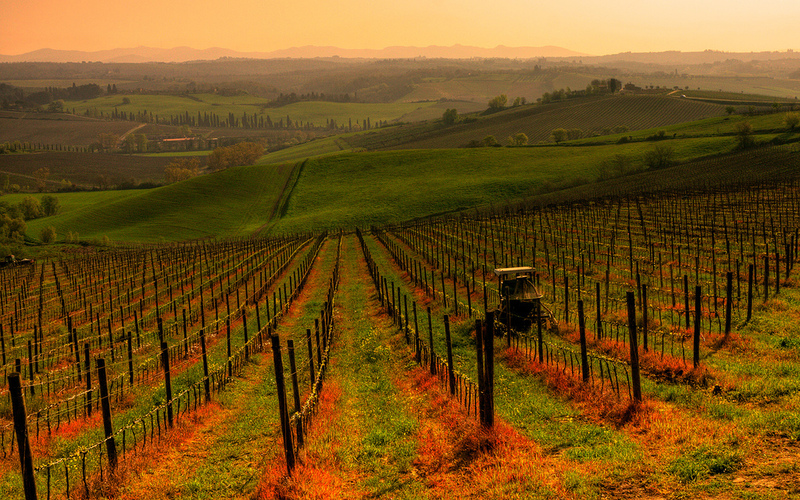 The Etruscans were the ones who first shaped the Chianti land. They abandoned the pastoral life for the agricultural, introducing the cultivation of grapevines. The Romans came next, and with them the beginnings of serious olive tree cultivation. With the end of the Roman Empire, the zone of Chianti went through centuries of battles, wars, and hardships, a situation that remained unvaried for all of the High Medieval ages. After the year 1000, the Chianti territory began to develop again. Its viticultural vocation re-emerged in the 12th century, when families like the Ricasoli and Antinori staked their claims to the territory and began to build the reputation of the “Chainti” denomination, creating one of Tuscnay’s oldest. The first documents in which Chianti is mentioned as a wine zone and a wine date back to the 13th century as a reference to the League of Chianti, created in Florence in an attempt to form regulations for Radda, Gaiole, and Castellina (today included in the production zone of Chianti Classico), producers of red wine made from a base of Sangiovese. As a rich territory, Chianti tempted the appetites of all the surrounding city-states, in particular Florence and Siena. An interesting legend tells the tale of how the rooster came to be the symbol of Chianti Classico. The two cities, exhausted from decades of conflict over control of the Chianti territory in between them, decided to resolve their dispute with a contest between knights. One knight from each city would ride out at the first call of the rooster towards the direction of the other city and knight; and where they would meet would be the border between the territories. The idea was to divide the land more or less in half, once and for all. Questa voce è stata pubblicata il 20 gennaio 2017 da principecorsini in Chianti, Storia con tag Chianti, firenze, gallo nero, Siena, Storia, Vino.